Fairbury Tarp & Repair, Inc.
Fairbury Furniture is a family-owned discount Home Furniture and Bedding store that opened in 2005. Specializing in the finest home furnishings and mattresses, Fairbury Furniture promises low prices and expert advice and service. We offer top notch customer service and superior knowledge of the furniture and bedding many community members have come to enjoy. When you shop at Fairbury Furniture, you know you are getting a great deal and purchasing from a staff that knows a lot about what they are selling. We are an authorized dealer of brands such as Ashley Furniture, Best Home Furnishings, Broyhill Furniture, Coaster, England Furniture, and more. Come meet with our experienced staff today and explore our convenient downtown Fairbury location, now located in the Walton Centre (100 W Locust St.). If you don’t see what you like in the store, we can order almost anything you desire. FREE delivery, setup and removal within 40 miles saves our customers time and money. We hope our site helps you understand who we are, but you really must come see us in person. Store hours are Monday thru Friday 10am to 6pm, Saturday 10am to 3pm, Sunday closed. 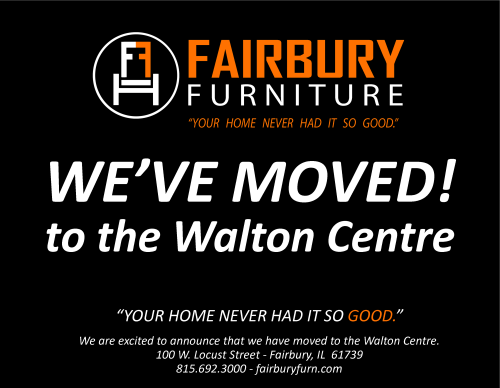 Call us at (815)-692-3000 or visit us online at: www.fairburyfurn.com.